KIEV, Ukraine -- A simple car ride across eastern Ukraine reveals just how much of the vast agricultural and industrial region Ukrainian authorities have wrested back from pro-Russian separatists. 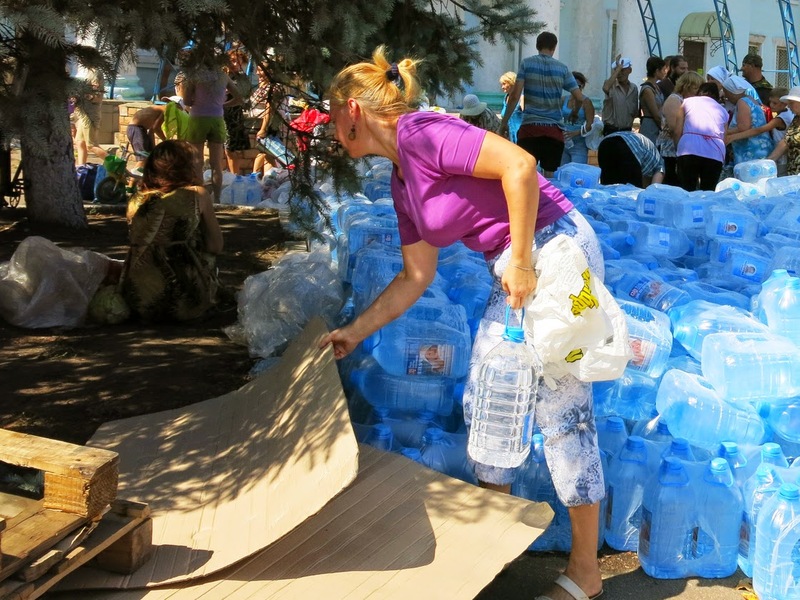 Ukrainian aid is doled out to people in Lysychansk. The evidence lies right outside the car window. Towns and villages that as recently as a few weeks ago displayed Russian and rebel flags on every conceivable surface now bear only the blue and yellow of the Ukrainian flag. Scattered cinder blocks are about all that's left of most rebel-held checkpoints, where the occasionally drunk separatist guards hassled, beat and detained Western journalists. Yet Ukrainian forces are more jittery than they were in May, when they were being shot down in helicopters or wiped out on patrol. At many of the newly minted Ukrainian checkpoints, visibly tense soldiers peruse not only passports, but often rummage through suitcases and search underneath carpets and seat cushions of vehicles. And while Americans are far more popular with Ukrainians than the rebels, even that fact doesn't ease the passage through checkpoints. One young Ukrainian soldier held up our NPR reporting team at a checkpoint until I showed him photos I'd taken. I opened up the three most recent pictures on my iPhone camera roll before putting away my device and sternly informing him that I wasn't about to show him nearly 1,000 stored photos. "Don't tell me what to do!" my translator says was his angry reply, but he gave up on the photo search. It's not just foreign journalists who have the Ukrainian soldiers on edge. Even a Kiev-authorized humanitarian aid convoy with official escorts and Ukrainian flags was stopped outside Lysychansk for at least 30 minutes while soldiers carefully investigated each truck, even crawling beneath them. Not that the soldiers' fears are unfounded. Mercenaries and arms for the separatist forces — both of which Ukrainian and Western officials say come from Russia — are a constant threat, although the Kremlin steadfastly denies sending or condoning either. Both Kiev officials and NATO say 20,000 Russian troops are currently hovering along a large swath of their border with Ukraine, and there are frequent reports of Russian military vehicles crossing illegally to this side, including a column said to have crossed this week that the Ukrainian president claims his forces destroyed. Terse vigilance, though, may not be the best public relations move right now. The United Nations, the International Committee of the Red Cross and other observers warn of a growing humanitarian crisis in eastern Ukraine as the civil war drags on. The U.N. human rights office has reported at least 2,086 deaths and upward of 120,000 displaced people. Beyond those numbers, some 250,000 residents of the besieged border city of Luhansk are without water and power, city officials say. Electrician Vladimir Herasimov fled with his wife and 9-year-old daughter from Luhansk to a refugee transit center in Svatoto about a three-hour drive north. He says that help can't come soon enough. "We'd been without water [for weeks], without electricity, without Internet, without phones," Herasimov says. "Every day, I had to get up at 8 a.m. and search for hours to find water and cooking oil." He added they ate canned goods they had stored in the house. The government in Kiev widely publicized its efforts to send convoys from around the country in recent days, which carried some 800 tons of food and other supplies to the Luhansk region to help. In the city of Starobilsk, Ukrainian aid trucks packed with bottled water, potatoes, onions, plastic sacks of grain and toilet paper were unloaded overnight at a warehouse by Ukrainian emergency and rescue services workers. Serhei Belayev led one of the aid delivery teams. He says, "Having the Ukrainian army retake these towns is making our job of distributing aid and making repairs to the infrastructure a lot easier. I believe there will be some kind of humanitarian corridor agreed to by both sides for delivering this aid [inside rebel-held Luhansk]." But it's taken days, if not weeks, for any supplies to reach recaptured cities in the east. Lysychansk, for example, was back under Ukrainian control on July 25, yet one of the rare aid shipments wasn't handed out there until Aug. 8. Meanwhile, a Russian convoy of some 250 trucks, which the Kremlin says are filled with humanitarian aid, is still sitting on the Russian side of the border. Ukrainian officials refuse to let the convoy in unless it's under the strict supervision of the Red Cross or other international observers, a suggestion that has the Russians lukewarm.